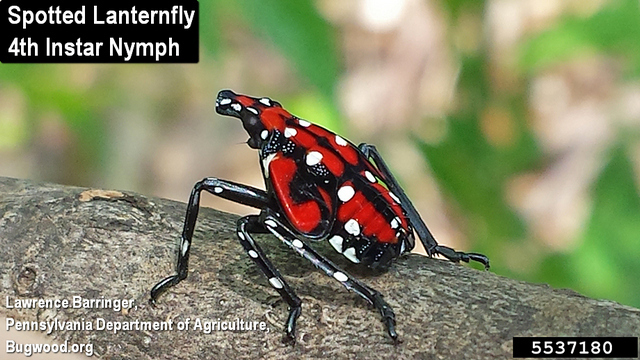 Spotted Lanternfly (Lycorma delicatula) is native to Southeast Asia. It was first found in North America in eastern Pennsylvania in the fall of 2014. 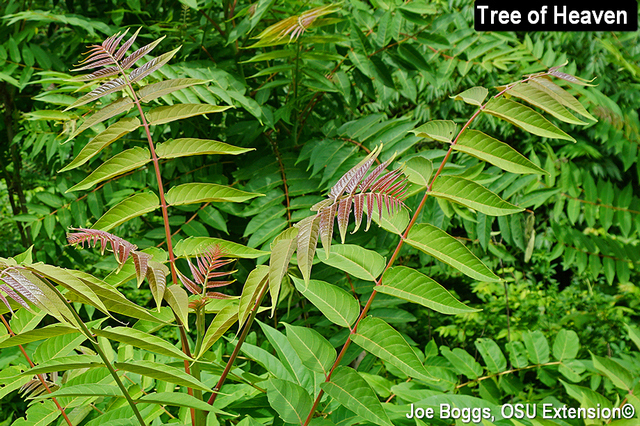 Reports at the time kept noting that Tree of Heaven (Ailanthus altissima) is the primary host. Frankly, I thought: "Who cares?" While host preference studies have shown that tree of heaven is a primary host; perhaps even "the" primary host, spotted lanternfly has been found feeding on over 70 plant species. In fact, the exact host range has not been determined; new hosts continue to be added. Woody plants dominate the host list; however, this sucking insect has even been found sucking juices from hops, soybeans, and some field grains. Spotted lanternfly seems to have a particular affinity for grapes with host preference studies indicating grape may rival tree of heaven as a preferred host. There have been reports from PA of feeding damage on the fruits and stems of grapes as well as apples. Lanternfly adults and immatures (nymphs) use their piercing-sucking mouthparts to tap into phloem vessels. Large numbers can remove large quantities of sap; however, that's not the end of it. 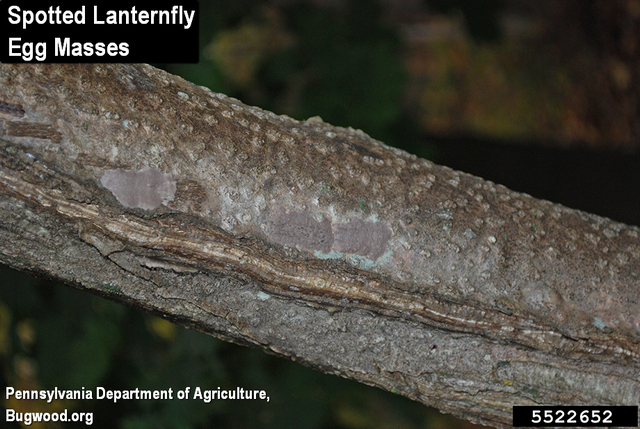 Their feeding holes remain free-flowing allowing phloem sap to leak long after the spotted lanternflies leave the tree. 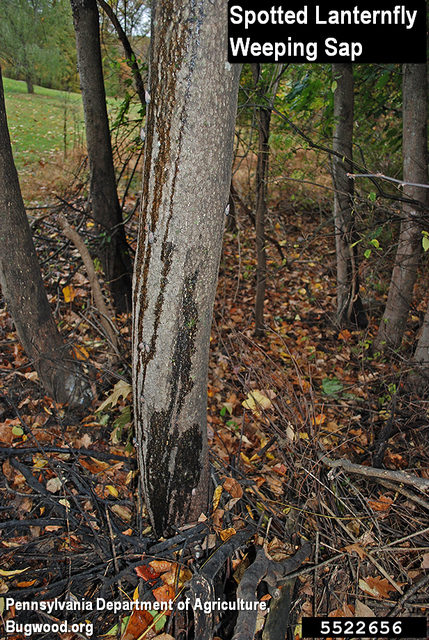 The combined sap-sucking and sap seeping can cause heavily infested trees to "bleed to death." Again, this would be a blessing if the damage were confined to tree of heaven. However, the potential impact of this Asian import on all of its hosts in North America is not yet fully understood. So, the answer to the "who cares" question is that we should all care. In November, 2017, a single female was found in New Castle County, Delaware, and a dead adult was found in Delaware County, New York (don't get confused by the two Delawares). 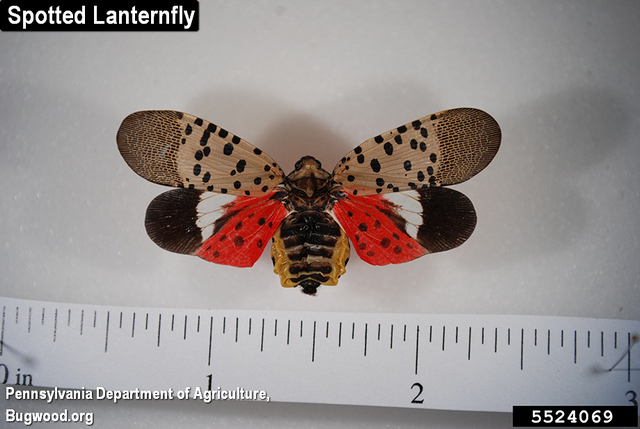 It was reported earlier this year that egg masses and a dead adult were found in Frederick County, Virginia (see BYGL Alert, "Spotted Lanternfly Found in Virginia," January 31, 2018. Whether or not these new finds came from known populations in eastern PA, or the lanternflies arrived on our shores independently, is not yet know. However, we here in Ohio should not assume the threat could come from the east; it could come directly from the Far East. This has been the case with Asian Longhorned Beetle (Anoplophora glabripennis) with new populations arriving directly from Asia rather than spreading from known infestations in North America. Spotted lanternflies are sometimes called "lanternmoths" because they look like a moth. But they are neither moths nor flies: they are a planthopper (order Hemiptera, family Fulgoridae). Most of our native planthoppers are very small insects best known for nymphs that are covered in tufts of waxy, white, flocculent material. However, spotted lanternfly adults are like a planthopper on steroids; they can measure over 1" in length and about 1/2" wide. Spotted lanternfly spends the winter in tiny seed-like eggs laid in rows on the stems of host plants, or any other flat surface. The eggs may be covered with a shiny, gray, waxy material secreted by the female. 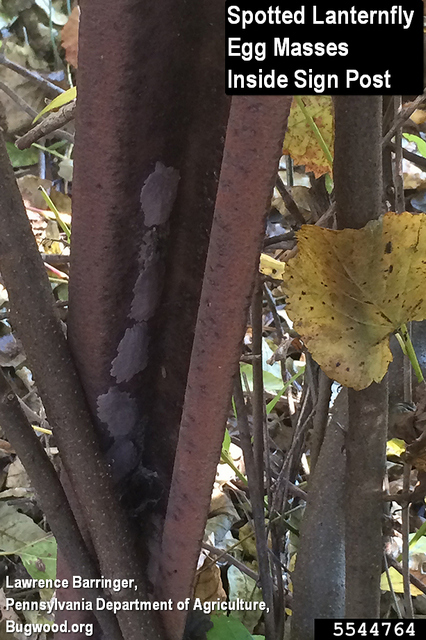 The covering eventually turns a dull grayish-brown with age. The "leggy" first instar nymphs that hatch from the eggs in the spring are black with white spots. 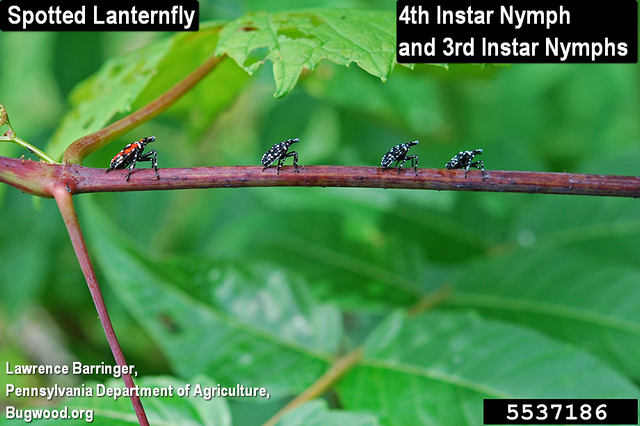 They continue this color motif as they develop through the 2nd and 3rd instar stages. They then molt into the truly spectacularly colored 4th instar nymphs which are red and black with white spots. Adult begin to appear in PA in late-July to early-August. There is one generation per year. 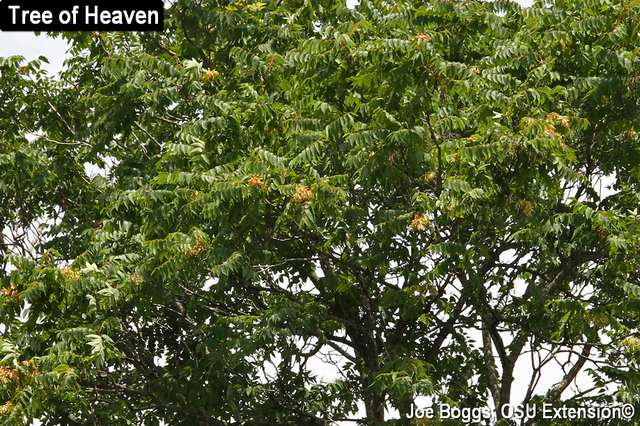 Although spotted lanternfly has a wide host range, tree of heaven remains a focal point for this insect: it is the preferred host for egg-laying adults. 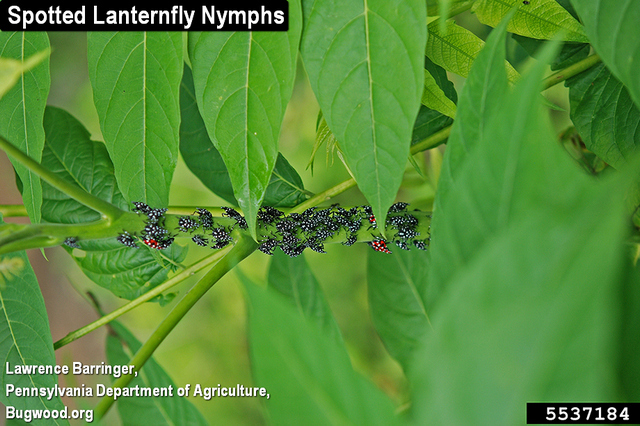 Nymphs feeding on secondary hosts tend to eventually make their way to a tree of heaven. Thus, this sentinel plant should be a focal point for monitoring. I tended to ignore tree of heaven in the past except for occasionally demonstrating the stinky nature of the leaves to friends and family. However, that has changed with the arrival of spotted lanternfly. I'm now making it a point to exam each one I come across for spotted lanternfly. 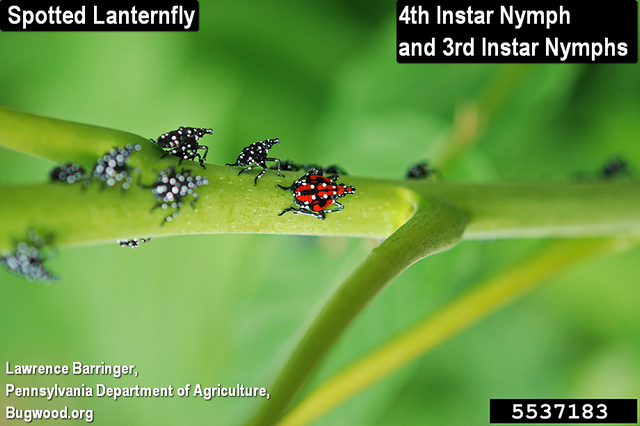 The early instar nymphs (black with white spots) are present at this time of the year; that's what you should be looking for. 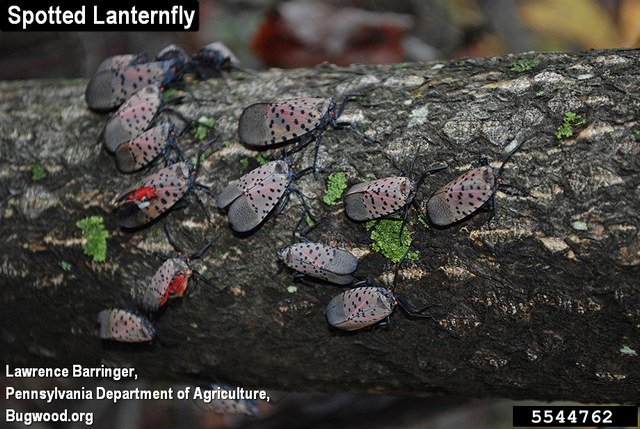 If you spot spotted lanternfly, report it immediately! 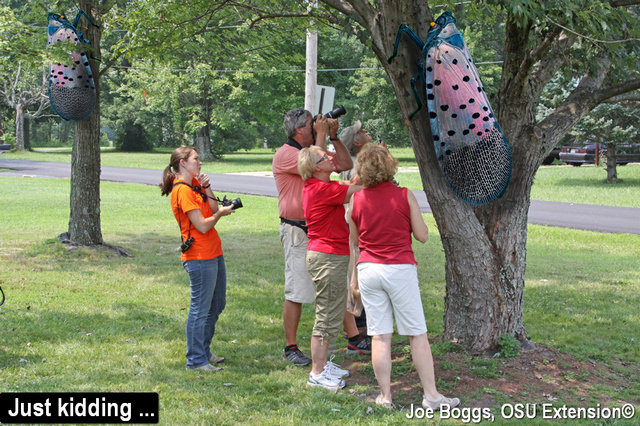 Even if you suspect its spotted lanternfly, but you're not certain, report it! 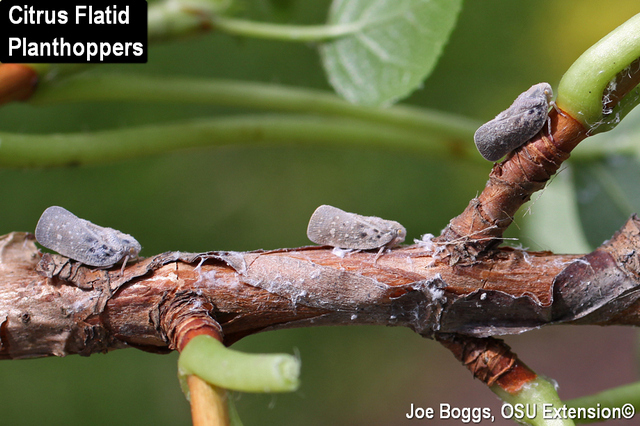 Buckeyes should contact the Ohio Department of Agriculture, Plant Health Division - Plant Pest Control. 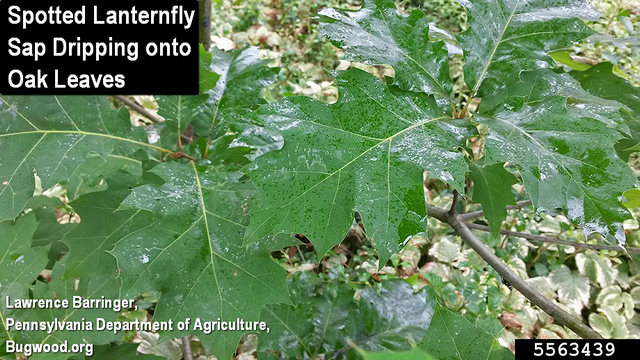 Hoosiers should contact the Indiana Department of Natural Resources, Division of Entomology and Plant Pathology. 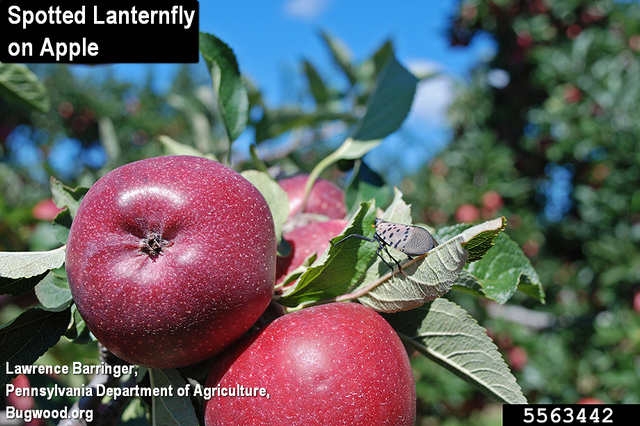 In Kentucky, you would report it to Kentucky's Office of the State Entomologist. In Michigan, it's the Michigan Department of Agriculture and Rural Development, Pesticide and Plant Pest Management Division.